Gale force wind, ocean swells, torrential rainstorms, devastating earthquakes, icebergs and dust storms – the earth offers up a variety of intense environmental situations to its inhabitants. With 24/7 operations that span the globe, diverse microclimates and weather phenomena, Chevron must contend with an array of natural conditions and be prepared for the possibility of a natural disaster to strike at any time. And, importantly, to keep the business running. A number of engineers, technology experts and scientists at Chevron focus on just that: how to design our facilities, operations and processes in a sustainable way to ensure safety and endurance through varying natural conditions – including disaster. Here we look at the role technology plays in emergency preparedness - protecting people and the environment before, during and after a crisis, and how the people of Chevron use it in their daily work. In 2013, a haboob storm occurred just off the coast of Western Australia, not far from the current site of Chevron’s Wheatstone liquefied natural gas facility. This is the work of a select group in Chevron’s Energy Technology Company (ETC). It means determining what you’re dealing with when it comes to soil composition, weather patterns, environmental characteristics and the makeup of what’s inside the pipe – oil, gas and anything else that could be present. The presence of mercury or hydrogen sulfide dictates certain design requirements for the platform or production facility, including the type of material and equipment that should be used. Design must include an eye toward shutdown conditions – to safely halt operations if necessary. Getting right the design basis is essentially about capturing all the parameters for which a facility needs to be designed to ensure it will meet its needs over the life of the project. Handling rapid changes in temperature, air condition, hydrocarbon flow rates – or dust threats – are all on the table in establishing the basis for design. Now the savvy engineers at ETC are trying to simplify and routinize the process to the extent possible. They are using a sort of paint-by-numbers approach, working to pare down what is theoretically an infinite number of designs into sets of the most common conditions, and creating design packages to suit them. When it comes to haboob-prone areas, for instance, dust-preventive enclosures for control systems will be a must. Oil and gas facilities are located in some of the world's harshest natural environments. So hurricanes, tornadoes, extreme waves, typhoons and tsunamis are all top of mind for the offshore structural engineers who design those facilities. It is their job to think about worst-case scenarios – and design platforms to withstand them. If a hurricane is looming, of course, facilities are evacuated and shut down in accordance with standard safety procedures. But setting up offshore structures in a way to stay upright in harsh environments is the job of experts Chevron’s Energy Technology Company devoted to civil, structural and marine engineering. Maximum wind, wave and current conditions are their focus – and they use many tools to figure out how to best design structures to sustain those extreme conditions, and to support crisis response and recovery activities after they pass. Traditional physical models bobbing in tanks of water are used to mimic the wind and wave conditions real facilities may face once erected, like this one used to test a Chevron platform that’s 100 m long by 100 m wide, and 70 m high, for U.S. Gulf of Mexico conditions. These small-scale models (here at a scale of about 1 to 59) are now complemented by beta programs that use computational fluid dynamics. This recreation of a program currently in development with Chevron and one of its partners helps engineers simulate offshore platform motions to evaluate “environmental loads” under wind, wave or current conditions. Using the computer model, engineers can test expectations and observations of wave patterns, recalibrate and refine those assessments after using the physical model. Then they can determine how the platform, mooring lines and risers should be designed. The physical-plus-digital approach helps design teams get more precise with their assessments of what a long-lasting energy structure needs – and perform the incredible feat of safely getting hydrocarbons out of the ground each day. Data is big these days as the information that represents lives, work processes and human interactions is catalogued into bits and bytes and distilled for interpretation. It is not just traditional data like spreadsheets, but also includes what’s called unstructured data – like photographs, videos or PDF files. There is so much data, there’s a whole science – involving statistics, modeling and analytics – devoted to making sense of it. 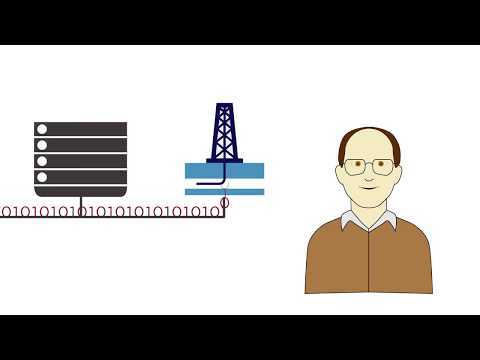 Chevron is using data science in a variety of ways to improve energy production, to make things safer, more efficient and smarter on a daily basis. But Hurricane Harvey showed one petroleum data scientist that his discipline could have a softer side: connecting people after a natural disaster. After Hurricane Harvey hit Houston and neighboring towns in late summer of 2017, hundreds of thousands of people were without power, shelter or daily necessities. 7,000 of them were members of the Chevron Houston workforce. This meant that not only were people and their property at risk, but staff levels in the company’s downtown offices were understandably light. True too at the company’s Houston Enterprise Data Center, one of two in the United States. The centers support Chevron’s global information technology (IT) needs, and always require at least one person there in the flesh, ready to touch a device if need be. For more than three days in August, this person was Eric Davis. A contract member of the workforce who’d arrived Saturday night for what he thought would be a 12-hour shift, Davis stayed for the duration to keep operations running – since flooding prevented anyone else from getting there. He relied on the center’s emergency supplies and slept on its cots until relief arrived Wednesday morning. Fortunately, the company’s data didn’t suffer the wrath of the hurricane due to a solid business continuity plan. With a significant financial impact to the business if the center shut down, that plan is thorough. With an important data center in downtown Houston, Chevron’s IT business continuity plan must be thorough to protect its 24/7 global operations. And it withstood the test of Hurricane Harvey and its extensive flooding – here near Chevron’s operations. Redundant systems across the data centers mean a production copy of the data and server is housed in one center and a disaster recovery copy and second server is in the other, with fluid movement between them if electrical outage or another crisis threatens. Some systems are considered “active-active” with copies in both centers at all times. In the case of Harvey, leadership initiated a movement of mission-critical applications to the San Antonio data center. Flooding ultimately threatened but didn’t encroach into the building itself. Data center manager Mike Greeney, whose own home sustained 24 inches of rain in seven hours, said the business continuity plan and all facility safety systems worked flawlessly. That design, he explained, includes backup generators in case of utility power loss, two sources of cooling, and utility power distributed underground instead of via above-ground power lines. And every square inch is covered by cameras. "When Hurricane Ike came through Houston in 2008, the data center never missed a beat." With a building that supports all business apps, email, cloud programs, supply and trading operations, even seismic data for a global energy company, never missing a beat is the expected state of affairs. But when a category four hurricane is staring you in the face, it can feel like a relief to get through it unscathed.